Earrings are a nice quick alternative to spending hours on a necklace. 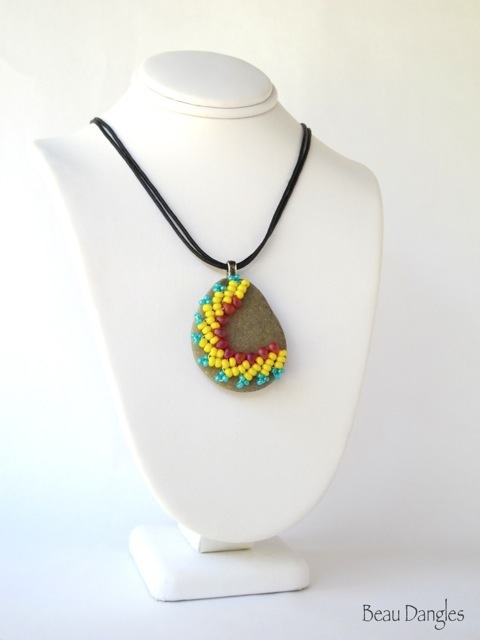 They usually work up fairly quickly — in the process I sometimes discover a design or a technique I can work into a necklace or bracelet. That’s always a plus. Categories: Earrings | Tags: beads, wire | Permalink. A few years ago I beaded a rock. Hadn’t done that before and it turned out not bad for a first try. Basically I treated the rock like a cabochon. 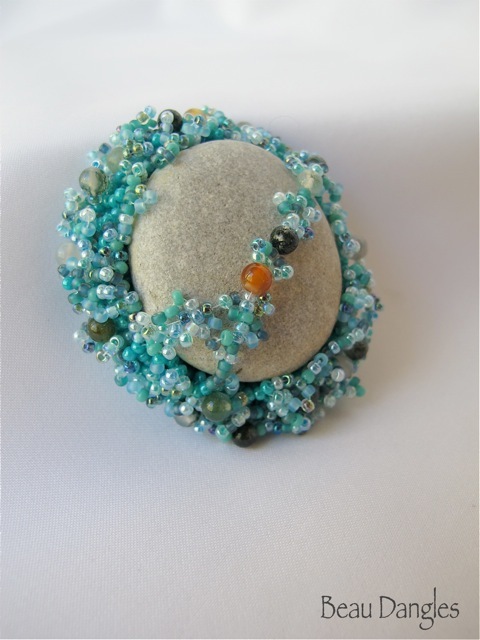 I chose a bead mix of blues hoping to create a look somewhat like water flowing over a stone. Although a few people asked about buying the piece I didn’t sell it. Instead it came to reside on a shelf where I’d periodically pick it up, run my fingers over it and put it back. I liked it because it was different. It was also a reminder to look beyond the same old same old when it came to my work. A week or so ago I walked over to a neighbour’s. A load of river rock had been dumped to stabilize a Texas gate. Within a few minutes I’d found a couple of flat stones to take home. I set them on my work bench and pulled out some small beaded samples from previous projects. 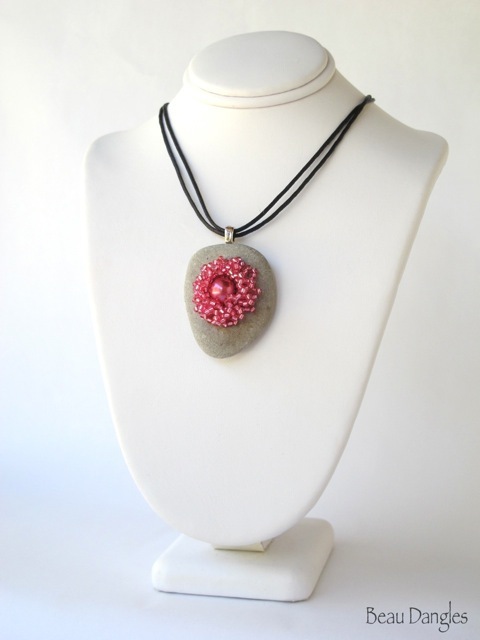 The first piece I picked up was a beaded bead in bright pink. I made it a couple of years ago on a whim. Can’t even remember what I had planned to do with it but now, well, it seems like it was waiting just for this. The second piece was a sample of St. Petersburg stitch — that design eventually became a necklace. I toyed with the idea of adding a few more beads to make a circle but I like the asymmetrical look better. Once I settled on the rock and the beads the necklaces soon came together. First I glued a bail to each rock using my old friend, 527. Once that set up I glued the beads to the front. Then I laced a double strand of cotton cord through each bail and wire wrapped the ends. I finished the pieces with handmade S-clasps of permanently coloured black wire. Categories: Necklaces, Other | Tags: beaded rock, beads, cord, glue, St. Petersburg stitch | Permalink. Only have 10 or 15 minutes to be creative? Try these simple but elegant earrings. They work up quickly and can be made to go with any outfit from casual to classic. 1. Cut 2 pieces of wire, each 2 inches (5 cm) long. 2. Make a loop on the end of one piece of wire. 3. Slide a pearl onto the wire. 5. Slide on the earring finding and another pearl. 6. Make a loop on the end of the wire and you’re done! 7. Make the second earring. Voila! You’re ready to go. You can design any number of variations. Coloured wire? Crystals? Faceted beads? Different sizes? Hang smaller pearls off the wired loops? 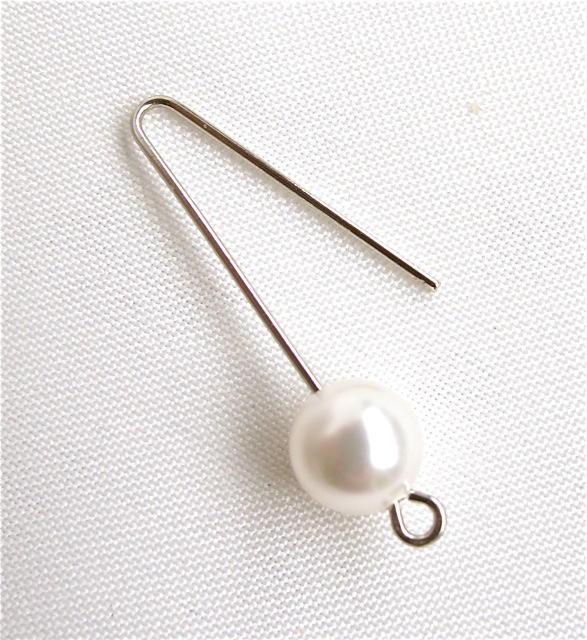 Categories: Earrings, How To | Tags: beads, pearls, wire | Permalink. The beading class at the library was a lot of fun. And of course the Swarovksi pearls and crystals were a real hit. I made up 14 kits many of them with bright colours assuming they’d be the most popular. Nope. Softer colours were usually the first choice. The bracelets were made using 2-needle right angle weave. That stitch can pose problems for some but this group caught on right away. I took a few pics as people were starting their bracelets. Later I got so caught up admiring the finished pieces I forgot to photograph them. They were gorgeous. To see other classes I offer, click here. Categories: Events | Tags: beaders, beading class, beads, kits, right angle weave, Swarovski | Permalink. Sometimes I lurk in thrift stores. On occasion I haunt yard sales and flea markets. My objective? I’m looking for rejects, for the jewelry that people are done with. The broken, tarnished, scratched, odd bits that no one wants anymore. Last weekend I paid $4 for several small plastic bags of jewelry donated to the local Church sale. When I got home and began untangling the jumble I discovered a sterling silver bracelet and a pair of sterling silver hoop earrings (stamped “Mexico” inside). The bags also held several gold chains of varying shapes and sizes along with a number of beads and like-new clasps. Another surprise: a bolo tie with a “slider” that will make a beautiful cabochon. Oftentimes these forgotten “treasures” aren’t much to look at but cleaned up they take on a renewed sparkle. Then there was a delicate rose brooch in a little blue box. I took a closer look at the lettering on the box yesterday: Fenton China – English Bone China. On a whim I googled Fenton China and found that I’d bought myself a “collectible” for the grand price of 25 cents. The bags do contain some things that aren’t usable, but that’s part of the fun. And being a packrat I will probably keep even these bits, at least for now, until I’m sure I can’t use them. I love new beads and findings but there’s something about the old pieces that draws me to them. They have their own stories to tell — and some of them are worth sharing again. Categories: Handcrafted Jewelry | Tags: beads, jewelry | Permalink.